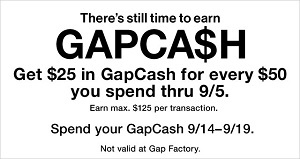 Get $25 in GapCash for every $50 you spend thru 09/05/2016. Earn max. $125 per transaction. You can spend your GapCash between September 14, 2016 and September 19, 2016. The offer is valid at U.S. Gap stores only. Source of the information is Gap. For more details about the offer see your nearest Gap store location in the U.S.